EarthBound, known as Mother 2 in Japan, was released in North America for the SNES back in 1995 and was met with only mild success. With underwhelming graphics compared to the JRPG giants known as Final Fantasy VI and Chrono Trigger, in conjunction with its unfortunate tagline “This game stinks,” the recipe for financial success was just not there. The game’s only claim to fame in the West has been the inclusion of Ness, EarthBound’s charismatically silent protagonist, in every incarnation of the wildly popular Super Smash Bros. franchise. Without Ness, there would honestly be a lot fewer Mother fans in the world (myself included, admittedly). It’s a shame because this is a game bursting with whimsical personality that more people need to experience to believe. If you’re in a similar boat to most people outside of Japan, you must be wondering what in the world is this game about? 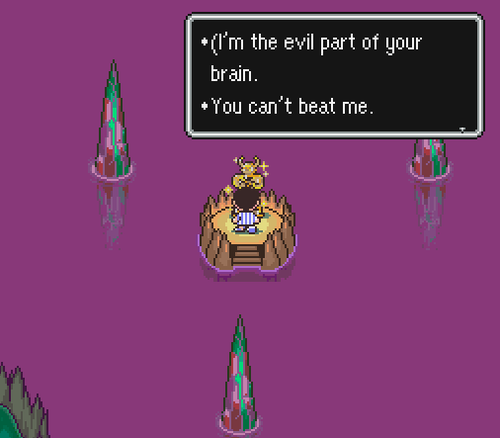 Well, EarthBound is a JRPG that attempts to break the traditional mold in almost every way possible, yet adheres to the standards set by its predecessors. The story begins with a meteorite crashing down in Ness’s hometown of Onett, carrying with it a mysterious bug from the future named Buzz Buzz. He warns Ness that an evil being called Giygas rules the universe in the future and declares that Ness is the only hope of stopping him. Buzz Buzz gives Ness the Sanctuary Stone and instructs him to find the 8 “Your Sanctuary” locations throughout Eagleland (Ness’s country, essentially). 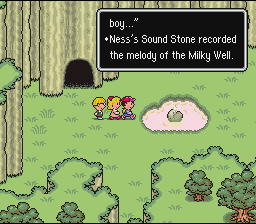 At each “Your Sanctuary” location, Ness learns a fragment of a melody that will allow him to unite his mind with the power of the Earth, which he can use to confront Giygas. Throughout his journey, Ness ventures to many strange lands and meets a hell of a lot of strange people. However, he’s also able to forge priceless friendships. He meets a caring girl named Paula in the town of Twoson who, like himself, can utilize psychic powers. The two later meet up with a tech-savvy boy named Jeff, who hails from an all-boys school in the chilly land of Winters. While he doesn’t have any psychic abilities, he can create inventions like the Heavy Bazooka and the Hungry HP-Sucker to nail the crap out of enemies. Last but not least, we have Poo, the young Prince of the faraway land of Dalaam. He’s a monk-like character who also sports psychic powers and is the sole user of the almighty PSI Starstorm. I should also explain the battle system too, huh? Well, if you’ve played any of the Dragon Quest series, than the battle screens should look familiar enough. It plays out in a first person view, with you putting in the commands for each character. The attack animations take the form of abstract flashes across the screens, with textual descriptions in the box. In battle, psychic abilities manifest themselves as PSI, or PK in the Japanese version, and act as magic. For example, PSI Fire will target a row of enemies, while PSI Lifeup will heal allies. PSI come in varying power levels, α, β, Γ, and Ω, that are gained upon leveling up. Alpha (α) is the lowest power level, while omega (Ω) is the highest. A quirk that the battles have that I’ve never seen anywhere else besides Mother 3 is the concept of the scrolling HP counter. When allies are hit with attacks, the HP gauge will count down rather than immediately changing to the numerical difference. This gives you the opportunity to heal up before your HP scrolls down to the number it should go to or even before the character dies! For example, there are enemies that have ridiculous final attacks that do twice the amount of HP you would normally even have at that point. But, if you scroll the winning text fast enough, the HP will stop going down and you won’t take very much damage at all. By the end of the game, all the enemies will constantly do “mortal damage,” but since all of the character’s HP counters are so high, there’s plenty of time to input healing commands. On the overworld, enemies are visible much like Chrono Trigger and Super Mario RPG, which is a godsend in my opinion. Random encounters, while okay sometimes, create boundless frustration if you’re lost, backtracking, or just want to explore. The way Ness approaches an enemy on the overworld can lead to surprise attack or a back attack if you let the enemy touch you from behind. Another amazing development this game has is the ability to auto-win battles. If Ness and his friends are much stronger than the enemies, than the game will grant an auto-win and you don’t even have to enter the battle screen at all! It makes me wonder why more games don’t make use of this genius system. I mean, why go through the trouble of loading up the battle screen if it’s only going to last 3 seconds anyway? 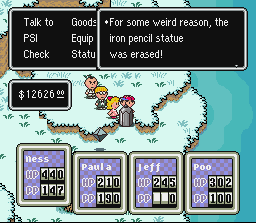 The creator of the Mother series, Shigesato Itoi, once stated: “I wanted to make a playground where people can appreciate the most insignificant things found within.” EarthBound is that playground. Like most JRPG’s, the game invites the player on a wild adventure, but through the eyes of innocent children. The game focuses a lot on the littlest details and obsesses over them, much like we all did when we were younger (or maybe even still do!). I mean, the first boss of the game is an ant, for goodness sake! EarthBound doesn’t have you traversing across mystical mountains or into fantastical castles. The setting places itself very close to home, where Ness and the gang go to the hospital to be cured of sickness, visit the drug store to buy medicine, and use the ATM to store money. 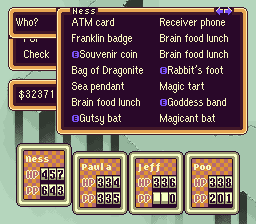 As you could imagine, Ness’s weapons of choice are all things one would find in a general store like bats and yo-yo’s. The armor each character uses takes the form of hats, bracelets, and lucky charms. No chain mail or shields here. Ness can even call his little sister who works part-time at the pizza place if he gets hungry. There’s also a status ailment known as “homesick” that happens when Ness doesn’t talk to his mom on the phone for a while. Despite all of the technical innovations that this game came up with, it unfortunately suffers from quite a few shortcomings as well. The most glaring example would be the terrible inventory system. Each character has his or her own slots for items, and they have to be moved back and forth if they want to be used by different people. Key items and equipment are also stored with the normal, consumable items too (who does that?). There is a unique item storage service known as the Escargo Express that Ness can call to hold items, which slightly alleviates the issue. The downside is that they have to be called whenever you want to get an item or store an item, and I believe there are areas where they can’t go, like dungeons. Also, this game is hard, mostly because the difficulty ramps up without the slightest notice from area to area. To make matters worse, there’s no reliable way to restore PP (PSI points) outside of the random butterflies on the overworld and items you find. This makes grinding risky business because you risk running out of PP when you might need it the most. An interesting fact is that Satoru Iwata actually reprogrammed the entire game from scratch in just one year, effectively saving the team a further two year delay. If I had to describe the music in EarthBound, I’d say it’s unorthodox. Unlike its straightforward contemporaries, the score, composed by Keiichi Suzuki and Hirokazu Tanaka, uses a quirky if not warped soundscape to highlight the sensation of creative freedom exuded throughout the game. The central plot device, the eight melodies, are a wonderful metaphor for Ness’s growing maturity. It’s a simple tune, yet it carries the weight of the world’s future on its notes. At each Sanctuary, Ness gains a new melodic piece as well as a vision from his childhood. Our lives are just a compilation of smaller experiences, after all. As his journey progresses, he gathers these fragments, which build towards the final goal of oneness with not only the Earth but within his own mind. Awfully Romantic, isn’t it? Other great tracks are all of the town themes and battle themes. Like, how was the SNES even able to produce the final boss music? Also, Ness saying “I miss you” at the end of the end credits theme “Smiles and Tears” gets me every time, I swear. EarthBound was constructed in a way that makes it seem like it could be a make-believe play adventure game between Ness and his friends. I like to think that the FPS and fighting genres are the pinnacles of extraversion, and I would use the same logic to point towards RPGs as the outlet for introversion with EarthBound as the ultimate example. Every facet of this game is the product and realization of a childish imagination come to life, and every bit of it is just so memorable. Who can forget when your path is blocked off by an iron pencil, and you have to enlist the help of Apple Kid to create a Pencil Eraser (metaphor for getting rid of writer’s block, anyone?). 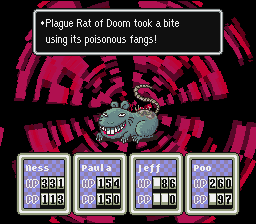 Or how about when Ness and friends fight their way through the mines, only to encounter 5 different moles who all boast about being the 3rd strongest? How about Moonside, the negative version of the Fourside metropolis and a more-than-obvious hint at a psychedelic drug experience? What about the references to Western culture like The Runaway Five (The Blues Brothers), the yellow submarine (The Beatles), or Diamond Dog (David Bowie)? Or Dungeon Man, the first combination of human and dungeon in history?! Or how about Saturn Valley, home of the eccentric Mr. Saturns (BOING!)?! The New Age Retro Hippie enemy?! The fact that this list is practically endless is an undying testament to how much imagination and unrestrained creativity went into the development of this game. I would say more, but you should play the game to find out yourself! Oh wait, EarthBound has had no plans for a North American re-release for like ever. However, on March 20th EarthBound did hit the Wii U’s Virtual Console in Japan! This sparked a huge revitalization in interest amongst the community, and the event was kicked off with Itoi himself playing through the game on a stream. 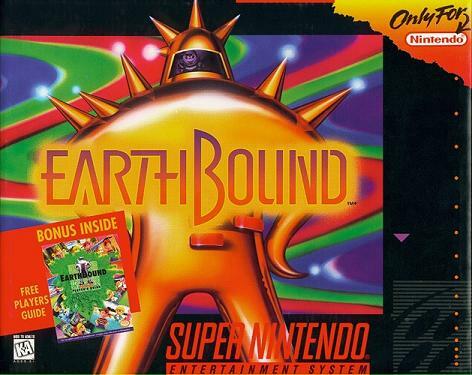 While the chances are slim, this re-release is a huge step in the right direction to getting EarthBound back into the Western spotlight as well as maybe getting an official Western release for Mother 3. 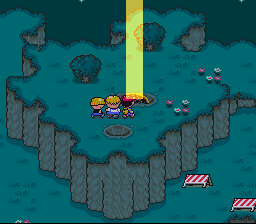 EarthBound is one of very few titles that goes beyond being just a video game. It embodies an ideal and provides a vehicle through which the player is allowed to rediscover a little bit about themselves. An exploration of mind and of the self, it draws upon the curiosity we had as children and combines it with the wisdom we gain as we grow older. Perhaps I’m spreading propaganda a bit here, but it’s undeniable that this game is special and is being robbed of the exposure that it deserves. 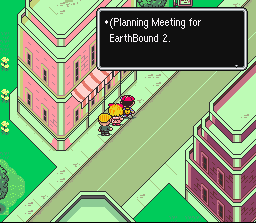 Update (4/17/13): Earthbound will be coming to North American and European Wii U Virtual Consoles. Rejoice! Being released at towards the end of the Super Famicom’s life with outdated graphics didn’t exactly impress very many people. Flawed inventory system and huge difficulty spikes. Never made it over the Pacific since its initial release! Some of the funniest and most self-aware dialogue in any game ever. Made use of many RPG mechanic innovations, like on-screen enemies, auto-wins, and the scrolling HP counter. An introspective, philosophical undertone that belies its humorous exterior. The game practically becomes a religious experience (just ask the Happy Happyists). Spawned a massive Western following that in turn produced the likes of Starmen.net, Fangamer.net, and the Mother 3 English fan translation. 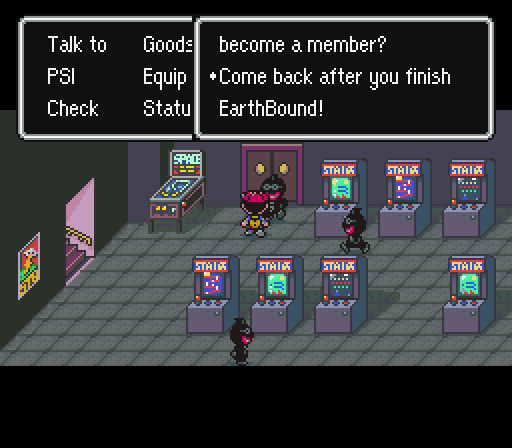 EarthBound…an oddly fitting name, don’t you think?